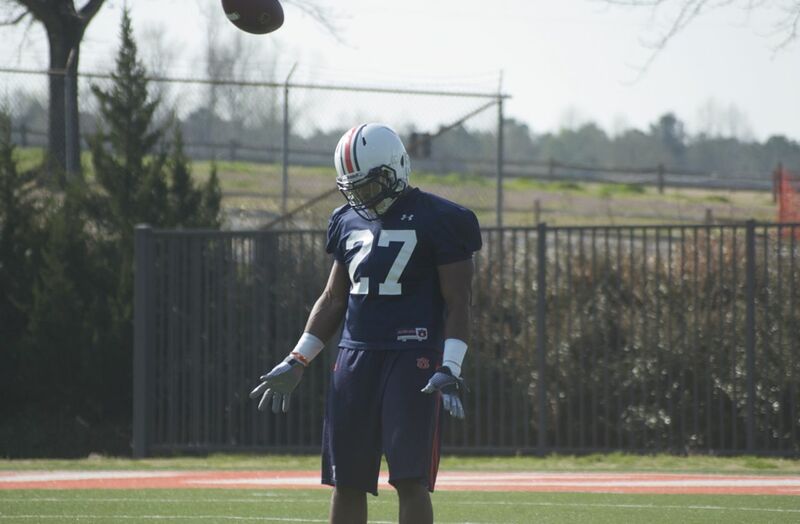 S Daren Bates will be held out of contact drills until two-a-days. He suffered a torn labrum in his left shoulder during the LSU game last year. Surgery was performed in January. Bates is in shape and all, but he's lost a lot of weight because upper-body weightlifting is out. So it goes. TB Onterio McCalebb said he's gained 10 pounds since the Outback Bowl. It's from weightlifting. His arms look significantly bigger to me. "O-Dog" said he can feel the extra weight, but it hasn't affected his acceleration. McCalebb is predicting a better season in 2010 because he's not partying as much. 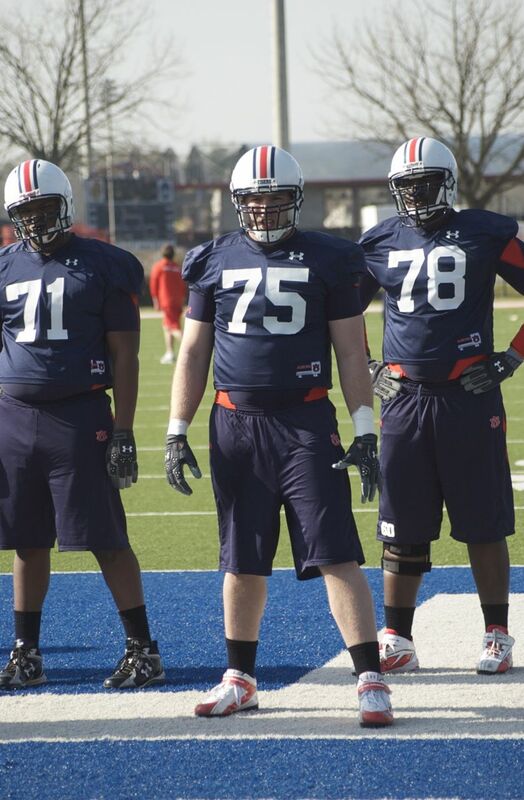 OL Bart Eddins is running with the first team at left guard. Big Snacks Berry played that spot last season, though he's been slowed after undergoing a relatively minor knee surgery. Eddins is aiming to make that spot his own. 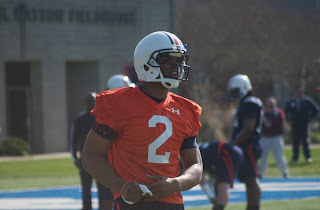 Gene Chizik said it's his understanding that S Zac Etheridge will try to play this fall. I haven't spoken with Etheridge to confirm that or understand the medical risks involved. McCalebb is "boys" with Pittsburgh Pirates outfielder Andrew McCutchen, who soon will begin his second season in the majors. They're both from Ft. Meade, Fla., and McCutchen's father was McCalebb's youth pastor. Hey everyone. 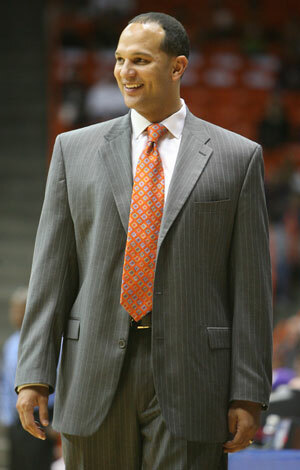 Auburn's new coach, Tony Barbee, will hold his introductory press conference at 5 p.m. CST. I am here. I will post salient information. Jay Jacobs: "It's remarkable how he's been able to build them in all three ways of life. 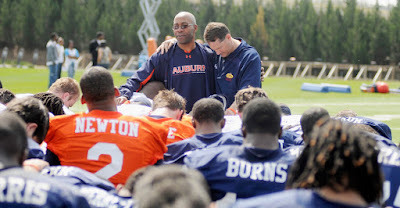 As you sat with Tony Barbee, you heard his passion, his vision and his plan for Auburn basketball." 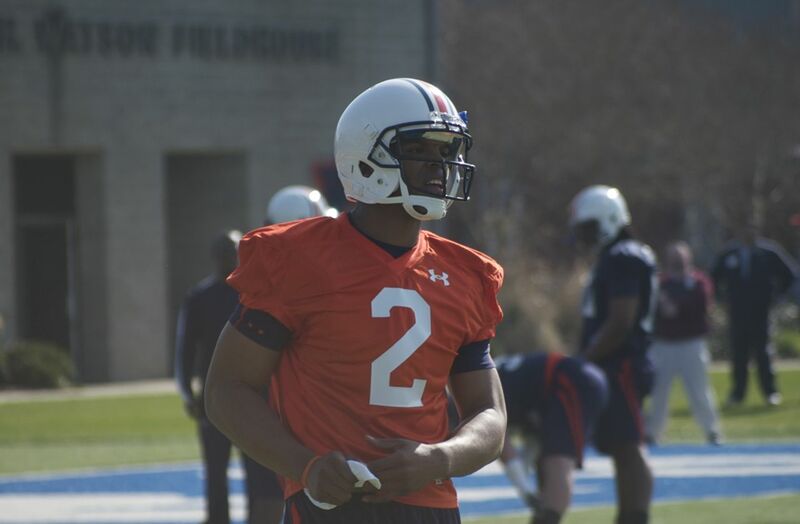 Barbee: ``War Eagle! I learn quickly. 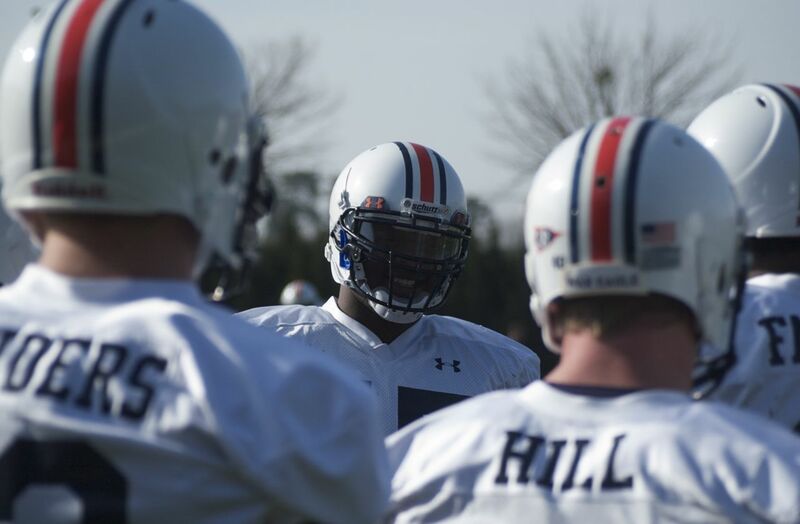 It's a great day to be an Auburn Tiger." "It was a very difficult decision to leave UTEP and the players because of how I do it -- it's all about relationships and family. When I looked at Auburn and I looked at this wonderful university ... first class ... and looked at this wonderful community ... first class ... when I looked at this beautiful arena ... that decision because easy to make." Referred to Auburn as "the best university in the state of Alabama ... and making it one of the best programs in this conference." "I'm a guy that's very thorough and a guy who does his homework." "It is my responsibility to live up to that bar that's been raised by all those great athletic programs at this university." "There is a precedent ... it has been done before. Why can't it be done again? That's why I'm here. There is noone who is going to out-work my staff and I. I'll work every day to make these players proud, the former players proud, the fans proud." He referred to Auburn Arena as the nicest arena in the league ... "and maybe in the country." ``The commitment has been made. My commitment to you is to take the program to heights it's never seen before." On his style: ``It will be fun. It'll do one thing. I've been to postseason play in 18 of 19 years. I'm madder than heck about that one year. We were starting over at UTEP. This style is built to win in March. It's a team you're going to be seeing play deep into March." To former players: "My office, my house and my phone will always be open to you." To current players: ``Your idea of fun and my idea of fun might be a little different. It's going to take a lot of hard work, but I've never been afraid of working hard." To the incoming recruiting class: ``I'll be getting in touch with you very soon to remind you why Auburn is such a special place." "Let's all get on the train." "We're going to go after and attract the best players in the country that fit with me, that fit with Auburn University, that fit for what Auburn stands for. We're not going to be afraid to go after the best players in the country." "We're going to be recruiting the media for exposure for support, recruiting the community, I'll recruit the student. My responsibility is to rekindle that love affair between the community and this basketball program." Scheduling: ``It's built on one thing -- getting into the NCAA Tournament." ``I've known John Calipari since I was 14 years old. He was my coach at camp. He's my mentor, he's my friend, he'll always be my coach." ``We're going right after Kentucky and we're going right after Coach Calipari. It's not an easy thing to do. Once we catch him, guess where we'll be. We'll be on top." "This is the second job in a row that I've taken without visiting. For me -- it's not about bricks and mortar. It's about people. There is a passion here." "We're going to apply pressure for 40 minutes. We'll play an up-tempo game ... but it's not helter-skelter. It's not run-and-gun. We'll be disciplined." "Everything is in place for you to ... sustain a championship-level program." "The success football has had here can only help with basketball." "I'm challenging our students. I'm challenging our fan base. We need you. We need each and every one of you there -- every night. It's my job to get the students engaged." agreement as soon as practical. 1. You will become the head mens basketball coach effective today. ($1,275,000). The term of the agreement will be six years. two car allowances each equal to five percent of your base salary. eligible for academic and performance bonuses on an annual basis. support our student-athletes in their efforts. upon the remaining terms set forth in the contract to be executed. family. God Bless and War Eagle! Hey everyone. I just hung up after a nice chat with Jeff Meyer, who used to play center at University of Massachusetts. He played two seasons there with small forward Tony Barbee, who you know better as Auburn's new basketball coach. In the interest of full disclosure: I was a enthusiastic Kentucky fan back in those days and spent many hours either booing or hexing UMass. So my conversation with Meyer was extra enjoyable because I booed him directly a time or two. This will not affect my ability to cover Barbee or anything because, as you know, my affinity for college athletics beyond the scope of this job has all but disappeared. Still, it's fun to talk about the old days. OK. On to what Meyer had to say. He was a 7-foot-2 center. 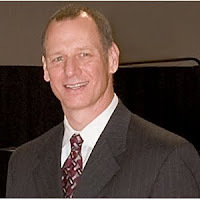 He now is a 7-foot-2 pastor in Wisconsin. On Barbee the player: ``He was a very bright guy who paid a lot of attention to our strategy. He benefited from a scouting report than any player we had. It's not that he'd know the plan; he'd ask questions. He'd go to John Calpiari and ask why we were doing something." On Barbee the person: ``The thing I really remember about him is that he was direct without being overbearing. He was the guy who would stand up in a meeting and speak his mind. If he thought you were loafing, he'd let you know and everyone else would know, too. Yet he didn't do that unless you deserved it. He was charismatic. He understood how to communicate with people, how to work with people." On how the time at UMass affected Barbee as a coach: ``We were going through a rebuilding process at that time -- Tony was there before me and saw tougher times -- and I think that gives you great insight into how to build. Two guys from those teams have become Division I head coaches (Barbee and current UMass coach Derek Kellogg) and I'd say that's highly unusual. Going through that experience gives players great perspective." On how Barbee handles himself relative to Calipari: ``I don't think you'll see the histrionics you see from John Calipari. Tony is ... how should I say this ... a little more smooth. He prefers to be level, but that doesn't mean he doesn't get his point across. He'll use any means necessary. I just don't see him as someone who screams at people very often." Hey everyone. It's 100% official -- Tony Barbee is now the head coach at Auburn. Barbee, who coached under John Calipari at Memphis, ran the show at UTEP this past season and the three before that. The Miners qualified for the NCAA Tournament as an at-large team earlier this month before losing to Butler in the first round. I had been hearing talk that Barbee was The Top Candidate at DePaul, which seems ripe for a revitalization. Chicago is a haven for prep hoops. 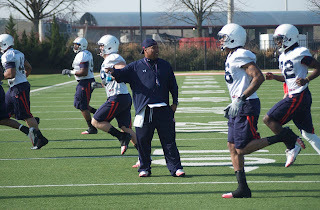 Still, Barbee will be coaching on the Plains instead. He went 82-51 in four seasons at UTEP. His team won 15 of its 16 Conference USA games this year and finished 26-6 overall. ``I’m very excited about the opportunity to join the Auburn Family and proud to be the next head coach at Auburn," Barbee said. ``We have challenges in front of us, but we also have great opportunities with everything Auburn has to offer—a great university, outstanding community, tremendous fan support, and a terrific new arena and practice facility. The time is now to take Auburn basketball to new heights." 2005-06 ... team went 21-10, 11-3 ... coach Doc Sadler left for Nebraska. 2006-07 ... team went 14-17, 6-10 ... Barbee's first season ... team returned three players. 2008-09 ... team went 23-14, 10-6 ... made it to the CBI finals. Here's what the quarterback had to say about his exit from Florida. ``Of course a lot of people think I got kicked out of Florida. I did not get kicked out of Florida. I transferred from Florida. I had a legal issue, a slip-up with the computer issue that I had bought from a person, which was stolen. That issue was taken care of way before I even left Florida. The charges were dropped and what-not. I left Florida because I felt like the type of player I was, I didn't want to sit behind no one. I have dreams, I have aspirations to be a starter for a Division I NCAA team and I think while I was at Florida, I probably wasn't going to get that. With Tim Tebow at the reigns and John Brantley -- me and him at the same classification -- something was going to have to give." On taking responsibility surrounding the stolen computer: ``Oh, it's mine. I'm a man. If I did wrong, I'm going to say I did wrong. Knowing what I know now, would I have bought the computer? No. Being a man, you have to take full responsibility for the actions that you do." 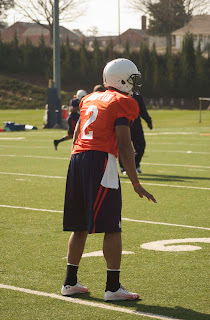 Gene Chizik said Tyrik Rollison remains on the team, is still in school and "his concern is solely on academics." The coach said Rollison is eligible. Kicker Morgan Hull has left the program. Fullback John Douglas has left the program. A walk-on named Jason King, who was nabbed for DUI a while back, has left the program. 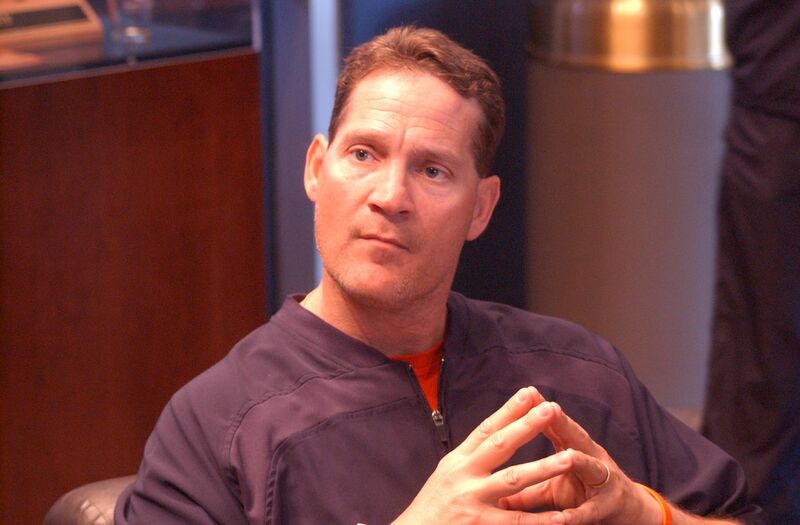 Chizik and defensive coordinator Ted Roof were evasive when asked if Auburn would run a 3-4 front this season. Roszell Gayden's first name is pronounced: "RAWS-el"
Gayden, who is left-handed, said he never has played on the right side. Yet he's OK with that, as you'd expect. 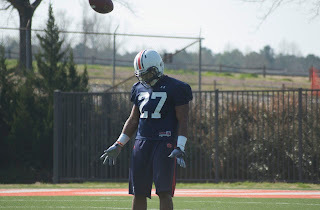 Chizik said he's decided that upgrading speed on defense is his No. 1 priority, which helps explain why he plans to move safety Daren Bates to outside linebacker. That hasn't actually happened, though, because Bates is out because of shoulder surgery. 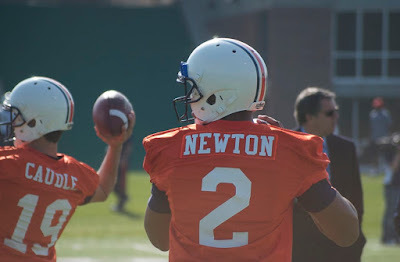 Cam Newton is wearing the No. 2 jersey. Photographic evidence above. 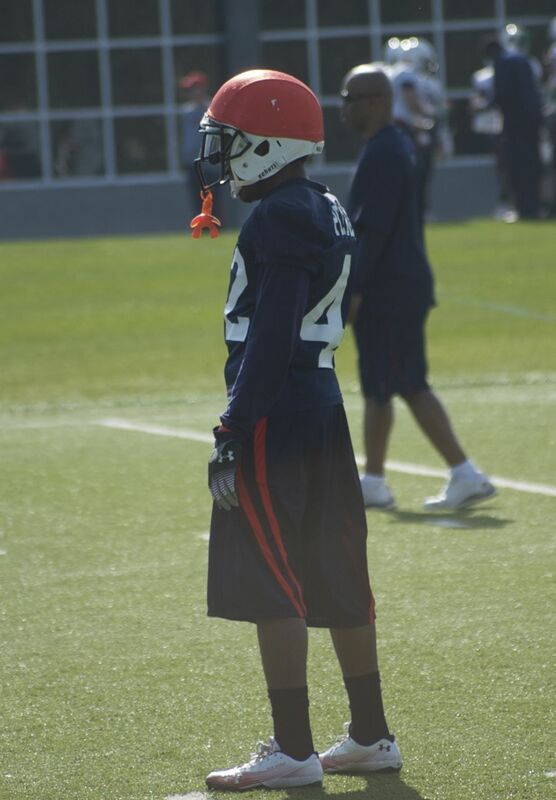 Daren Bates (shoulder) and Travante Stallworth (knee) didn't participate in practice. Philip Pierre-Louis was there, too! Quindarius Carr and Mario Fannin were the only guys fielding punts. That's a stretch, though ... Trooper Taylor had them heading the ball like soccer players. I guess that's a drill to help them align under the ball properly. 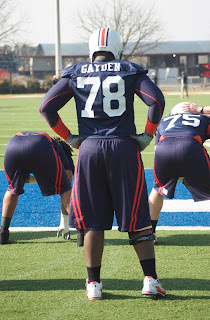 The new offensive lineman's name is now listed as Roszell Gaydon. Note the "o". 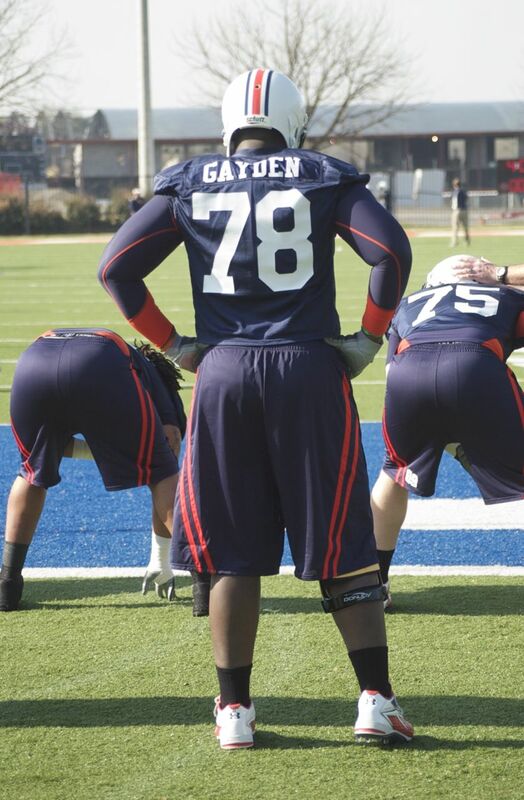 His jersey reads "Gayden." We'll have to see which version is correct. The wideout from Brantley is now Anthony Gulley Morgan. His jersey reads "Morgan." Tyrik Rollison was not out there. He's not listed on the roster. He'll remain on scholarship through the school year. Brandon Mosley began the first drill as the top guy at right tackle. Roszell Gaydon was the second guy there. 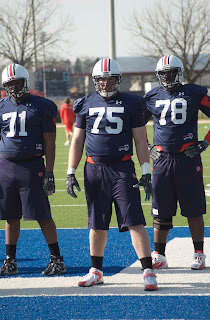 The New Guy numbers: Newton (2), Gaydon (78), Mosley (75), Jessel Curry (33) and Craig Sanders (13). Observe Brandon Mosley (75) and Roszell Gaydon (78). Trooper Taylor doing his thing. Mario Fannin "fielding" punts with his head. Philip Pierre-Louis -- in the flesh! Gene Chizik and Ted Roof Rusted conferring before practice. Hot Carter prior to practice. Hey everyone. 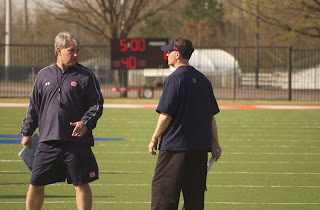 Sam Houston State coach Bob Marlin will be interviewed by Auburn in the coming days. Athletic director Jay Jacobs asked SHSU's athletic director, Bobby Williams, for permission on Monday afternoon. This is attributable to a Houston TV station. Marlin's Bearkats clobbered Auburn this season in Beard-Eaves Memorial Coliseum (big accomplishment) and qualified for the NCAA Tournament. He is 225-130 in 12 seasons at Sam Houston State. His teams have cracked the 20-win plateau six times. Hey everyone. Auburn's search for a new basketball coach is beginning to take shape. We know, courtesy of the Denton (Texas) Record-Chronicle, that North Texas coach Johnny Jones has been contacted and is expected to interview for the Tigers' gig this week. I haven't yet been able to confirm this on the record, but we believe Jones will be on campus Thursday for an interview. He will be the first candidate to meet face-to-face with athletic director Jay Jacobs. Jones is 47 years old. He played at LSU from 1980-84. He also coached under Dale Brown and played a significant role during the days of Shaquille O'Neal, Mahmoud Abdul-Rauf and Randy Livingston. He spent time as an assistant at Memphis prior to John Calipari's arrival and spent the 2000-01 season as an assistant at Alabama. What can we glean from his record? There are two explanations. One is that he's a decent mid-major coach who occasionally takes a team loaded with experience and challenges for an NCAA bid. Call it Jeff Lebo Syndrome. The other is that Jones is a guy who needed a few years to learn how to build teams and now has reached a certain level of celestial understanding. He has at least 20 wins in each of his last four seasons, which is significant given the UNT context. Which is it? I really don't know. Hey everyone. Former Auburn coach Jeff Lebo clearly knew his days at Auburn were numbers because he already has found employment elsewhere. He was hired today as coach at East Carolina. We know this because ESPN.com, citing anonymous sources because news this big might get someone exiled to Lesotho, reported it this morning. I think he'll be fine and competitive at ECU. He's back in the Carolinas where people know him and about him. Hey everyone. Auburn's baseball team, which hasn't qualified for the postseason in a while, opened Southeastern Conference play with surprising power this weekend. The Tigers swept a three-game set at Georgia. And it wasn't just a sweep. Auburn won by an aggregate score of 43-9. Hunter Morris, 1B ... finished 10-for-16 with 14 RBIs. LHP Corey Luckie (Prattville High graduate) ... allowed one run in seven innings pitched on Friday, striking out seven batters and walking only one. OF/RHP Justin Bryant goes 4-for-6 with 8 RBIs on Friday. Auburn now is 14-5 overall and 3-0 in the league. The team plays at home next weekend against South Carolina.